Shown are seniors John Bruner, Matt Mezel, Kekoa Gross, Peter Walsh and Keegan Landers. Did you dress up and show some pirate pride for homecoming? Starting the week off was band/concert T-shirt day. Many people brought band shirts and there was at least one from every genre. It had the second most people dressed for the week. Woodstock Wednesday came and brought a technicolor light show with tie-dye shirts and headbands. Everyone was decked out in hippie tie-dye and jeans. 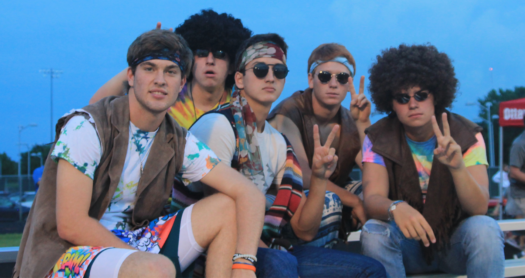 Wednesday was the student body’s favorite day and had the most people dressed up of the week. “Tie-dye was my best outfit of the week,” said senior Aurora Wiltfong. Thursday was class distinction day. Freshmen were country styled, sophomores wore 50’s sock hop, juniors had disco style and seniors wore 90’s style clothing. Friday was the final storm as the football team wore their jerseys and all the students brought out our school colors in anticipation for the game against Morris. “Spirit day was my favorite, I loved being part of something bigger than myself. The energy we had during the day is what made it so special,” sophmore Bella Billings said.